You probably know that messy process of reaching for blank post-it and/or pen, discovering you are out of (or had been robbed of) office supplies again and rushing to use computer (computer can do everything!) to create text file with some filler name (111.txt) and type stuff in. Probably dropped phone by now as well. 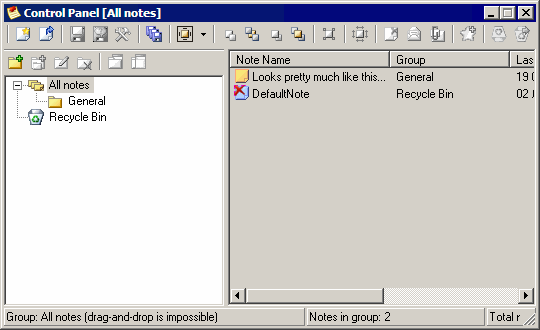 PNotes is one of many software to replace that mess with system of convenient and customizable notes in your computer. App itself mostly sits in the tray but its main function is to populate your desktop with floating freely editable notes. Notes appearance can be skinned (with several styles bundled and more available for download from site) and text inside note can be styled, with all functions common to WYSIWYG editors. There is also separate control panel view that acts as additional interface window and index of notes. If there ever was one app to benefit from light interface option this would be it. There are so many functions and so many things going on that interface mostly consist of buttons to press. Basic functions are intuitive but anything else takes a lot of looking for. In-note editor controls are too small and hard to hit with cursor. Common keyboard hotkeys (like Ctrl+B) doesn’t work either. By the way overall app has hotkey support for most of functions, but settings are blank by default. No conflicts with other apps, but you want it – you have to find and set it up. Highly flexible and convenient (for core function at least) app, open source and with portable version from PortableApps. Too many buttons leave initial impression of cramped but in the end you can get used to those. I absolutely love these kind of sticky notes. Make it so easy to keep track of to-do items, and free my computer screen from all the post-its. My favorite one is “Stickies” , because of some very interesting features. Myself I like the idea but hadn’t put them in my work-flow properly yet. Probably I just don’t need many notes often so keeping things simple. Thanks for suggestion, bookmarked to check it out. Interesting review, thanks! I tried this software a couple of time, but I just cannot get used to creating a new note when I need it; I will always reach for a paper and pen first. Very advanced. Even does graphics (pictures) ! Despite numerous tries virtual PostIt notes just don’t work for me… On other hand I am now very much into WorkFlowy.